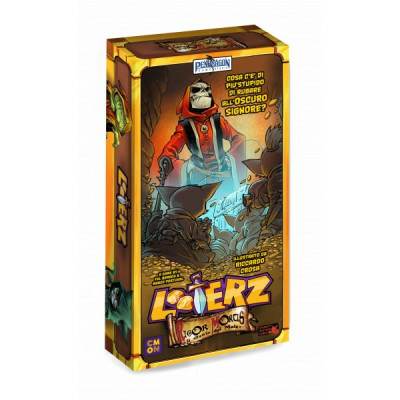 In Looterz, players are racing to collect the most loot possible by recruiting a team of Looterz. Your loot is never safe though as many Looterz have the ability to steal Loot from other players. A player's turn involves four phases: Recruitment, Looter Activation, Recruitment, then Sacrifice. Each recruitment phase allows the player to draw a card from the deck or put a Looter from their hand into play. Players are then allowed to choose to activate their Looterz in any order. Finally, if players have more than three Looterz in play, they must discard down to three. Looting is resolved by rolling dice. The number of hearts on a Looter indicates the number of dice a player may roll during the Loot resolution.